Safco's Economical corrugated containers provide additional recycling and waste collection for special events. 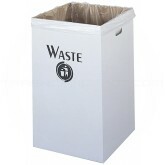 These disposable receptacles store flat until needed and are easy to dispose of when no longer required. To use, simply assemble and line with your waste bag (not included).